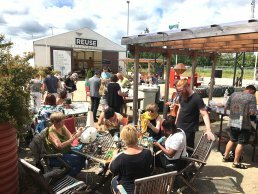 Aarhus’ recycling center, Reuse, is encouraging citizens in reusing through social media platforms and workshops. In the heart of Aarhus you’ll find the recycling center Reuse. Under the slogan “Give what you have and take what you need,” the center enables citizens to bring in and pick up furniture, as well as items and materials that would otherwise be discarded. Reuse is not only a recycling center in the conventional sense, but also a platform for engaging the community. It communicates with and reaches out to citizens through social media, organizes activities such as upcycling workshops, and offers “goodie boxes” packed with essential items for youngsters moving out of their parents’ home. Reuse engages citizens with a wide range of workshops where participants learn how to upcycle, recycle, and repair items. The recycling center’s communication strategy has proven successful, with an average of 350 visitors every day. 500 tonnes of furniture, items and materials that fall out of the normal recycling loop (e.g. flea markets and thrift shops) are recirculated through Reuse. In 2018, the recycling center will relocate to the southern part of Aarhus (Aarhus Sydhavn), taking over an old slaughterhouse and transforming it to its new use. Reuse is an example of how recirculating materials can turn waste into a resource and extend the lifespan of household items, thereby making the city more sustainable. Reuse promotes the circular economy by collaborating with organizations, citizens, artists and companies who can make good use of recycled and waste products. Reuse recirculates 500 tonnes of “waste” materials that fall outside the conventional recycling loop, leading to savings of 550 tonnes of CO2 every year.